OpFlash Producer Happy to Let EA & Activision "Duke It Out"
Operation Flashpoint Executive Producer Sion Lenton says he's happy to let EA and Activision "duke it out" while Codemasters works on attracting gamers who are tired of the same old thing in the military shooter genre. The battle for the military shooter crown isn't exactly an epic clash of the titans. Activision dominates the market so utterly with the Call of Duty series, after all, that even a resurrection of the once-mighty Medal of Honor series amounted to little more than throwing rocks at tanks. Nonetheless, the most realistic hope of loosening Activision's grip on the genre lies with EA and while that story plays out Codemasters is quite content to keep its head down and stay out of the way. "I think we've got a longer game plan. If I'm being honest I'm going to step to one side and let EA and Activision duke it out," Lenton said in an interview with CVG. "I'm actually much more interested in being in a very different space from those guys, hence the co-op side of things and also that kind of authenticity that we have here which is almost that reportage style, a gritty documentary style." 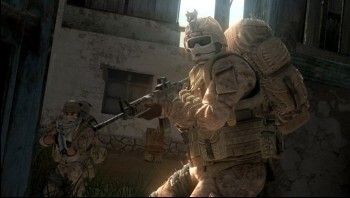 Lenton described Operation Flashpoint as a "more cerebral" game, saying that rewards come from learning how to deal with situations rather than simple reflexes, and that the necessity of teamwork rather than movie-style tales of individual heroism "is the bastion and central premise of the game." "I don't know about you but I've started to sense a little bit of genre fatigue, for want of a better word, and I think - I know I am myself - people are yearning for something a little more different," he added. "Something that challenges them a little more, I think that's the kind of thing we're trying to offer here." Operation Flashpoint does have a decidedly different feel than most shooters; it's slower, tougher and, as far as I'm able to judge such things, more realistic than the heavyweights in the genre. But the last release, Operation Flashpoint: Dragon Rising, was plagued with glitches and bugs that often reduced gameplay to an exercise in tedium and frustration. Differentiation is important but a stable game experience is pretty vital too. Hopefully the next release, Operation Flashpoint: Red River, which comes out in June for the PC, Xbox 360 and PlayStation 3, will do something to address those technical shortcomings.